At present, auto emissions are the main source of city air pollution. The development of clean energy vehicles has become more and more important. Compressed natural gas vehicle (CNG ) with low energy consumption, pollutant emissions is internationally recognized as the most ideal vehicle alternative energy. Development of natural gas vehicle to solve the problems of environment pollution and energy saving is significantly important. CNG vehicle gas pressure meter (or CNG sensor) is a very important component for car CNG system, it can not only directly display the vehicle storage tank and a high-pressure pipeline natural gas pressure, but also can be displayed by the pressure into electric signal output to the cab console on oil gas switch, so as to accurately display the on-board energy storage gas in gas reserves. CNG gauge is used to measure compressed natural gas. It is widely used in daily lives. This CNG Pressure Gauge is cased in ABS shell, with accuracy upto 2.5. It is suitable for cng vehicle and other products. Ma Anshan Exact Instrument Co., Ltd is a professional manufacturer of all kinds of CNG Pressure Gauge instruments. Our company specializes in designing and manufacturing standard pressure gauges, thermometers, capsule gauges, and so on. Our CNG Pressure Gauges are widely used in oil, chemical industry, metallurgy, electricity, manufacture, papermaking, food, energy, etc. Our CNG Gauges have been exported to U.S.A, Canada, Europe, Spain, Egypt and South-east Asia, mid-east and so on. 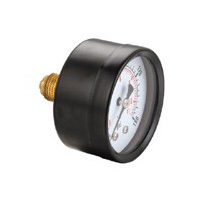 Water Test GaugeWater test gauge is short for water pressure test gauge. It is composed of pressure gauge and copper parts. It is mainly used to offer service for measuring water pressure.